The architectural character of Mithymna is living testimony to a tempestuous and much-troubled historical continuity.The town, rooted on the rock which is dominated by the medieval Castle and spreading down to the sea, still retains its own individual character as that was shaped in the last two centuries of Turkish rule, particularly in the nineteenth century. It is a traditional type of settlement which climbs upwards and is flanked by steep cliffs. The medieval Castle is its point of reference, and it is around this that its fabric is deployed. The castle itself is not large; it has a perimeter of 310 metres. The development of the town in a confined space, originally for reasons of defence and also because of the sharply sloping rock, enforced an exceptional utilisation of the space. 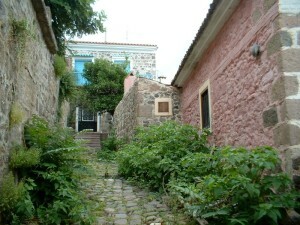 Thus, Molyvos has preserved a com-plex of paved and cobbled mule paths (kalderimia}, along which the older buildings, often contiguous, make up a dense and cohesive whole. The amount of open space in the historic nucleus of the town is limited. The Market lines two streets which converge in a small square. This is the vital space of the town’s social and economic life. The streets of the market are shaded with salkimia (foliage) at the dividing line between the ground-floor shops and the living quarters on the first floor. 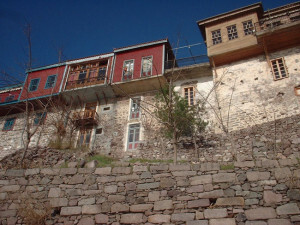 Most of the traditional buildings are two-storeyed, with stone and wood as their building materials. Usually the stone walls have remained unplast-ered and are pointed with mortar. Often, when the upper floor is of wood, the walls project beyond the outline of the ground floor and form sachnisia (oriels). Carved wooden beams support the sachnisia, which serve to enlarge the central space of the living quarters. In Molyvos, many mansions dating from the late eighteenth century have survived; examples are the Yannakos mansion and the building hous-ing the School of Fine Arts (formerly the Krallis mansion), with elaborate wail-paintings. Many of the town’s buildings have a neo-Classical morpho-logy. The harmonisation of differing architectural types into a single organis-ed whole makes Molyvos a place of rare beauty. 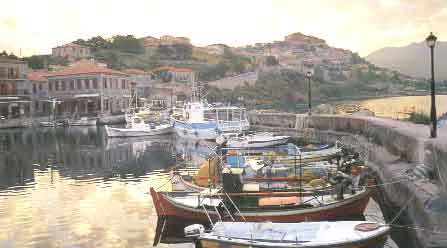 On the edge of the town, the picturesque harbour completes the unique picture of Mithymna. The parish churches are also buildings characteristic of the place. The Basilica of the Archangel (Taxiarches), which was built in 1795, is one of the most important architectural monuments of Molyvos. St Panteleimon — built in 1844— has a number of neo-classical features. Also a noteworthy example of church architecture is St Cyriace. In Molyvos, a large number of public fountains, from the time of Otto-man rule with relief inscriptions and decorations, have been preserved. 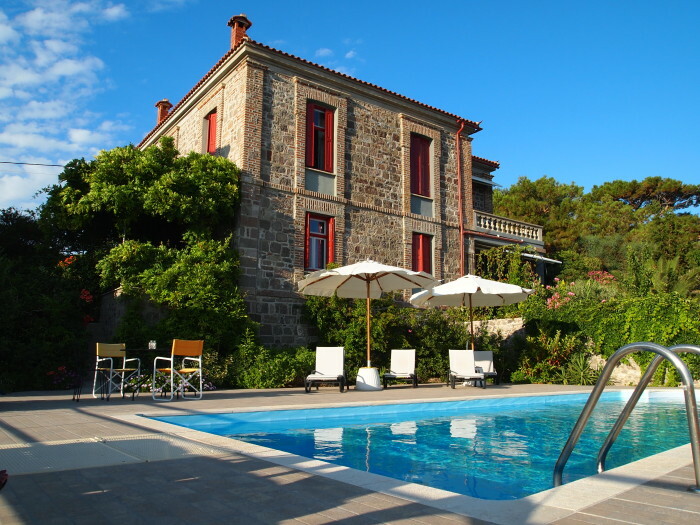 The Old Baths building is another architectural monument of the last ce-ntury. The Mithymna Municipal Gallery, with an impressive collection of works of art, was set up in 1961. The Archaeological Collection is housed in the Town Hall, while the Municipal Library enriches the town’s cultural life. Molyvos by providing many limitless sources of inspiration has always been a point of attraction for many artists, local and foreign. Many cultural manifestations are organized every year in Mithymna, such as conventions, lectures, exhibitions of paintings and popular art, theatrical and folkloric performances.